Cosy Cottage " Eliza Stays" Getaway. Property 3: Cosy Cottage " Eliza Stays" Getaway. Vera's Apartment - Creative. Quirky. SUPER Clean! Property 4: Vera's Apartment - Creative. Quirky. SUPER Clean! 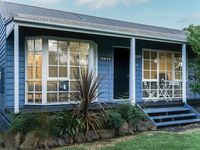 Eagle Bay Cottage -Lakeside Village -Dog Friendly! Property 25: Eagle Bay Cottage -Lakeside Village -Dog Friendly! Trudy and Robert have painstakingly handcrafted an absolute treasure box of a cottage. 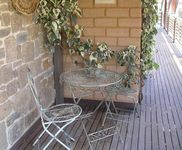 Mud bricks, superbly finished timberwork, beautiful European sensibility with gorgeous appointments of the highest quality - and everything you could possibly need for a luxurious and peaceful stay. Set in wonderful landscaped grounds with private lake/small dam and backing on to bush it is amazingly quiet and relaxing. We thoroughly enjoyed Trudy's homemade strudel with cream, and a tour of her extensive vegie patch and potager. Trudy was so easy to communicate with, and very generous in every way. We came down from Wagga for the Lost Trades Fair, and hope to be back next year. As owners of our own 4.5star cottages, we can see the enormous effort, care and skill that has gone into The Keep. It is an absolute credit to them. Thank you for such a fabulous stay, Trudy and Robert.